Nationwide Industrial Supply offers one of the largest selections of material handling and drum handling equipment in North America. 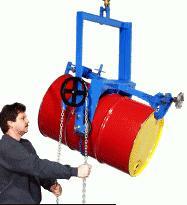 Below-the-hook drum lifters offer a variety of options to lift and poor drums using a forklift or overhead crane. Use the vertical position drum lift to lift and transport a loaded drum in vertical position with your crane, monorailor chain block. Holds your drum securely by chain and ratchet mechanism and a bottom support bar. CUSTOM ORDERS ARE OUR SPECIALTY!Options: Stainless Steel Wash-down models available for food and Pharmaceutical applications.Spark Resistant Models Available for explosion proof controled environments. STANDARD DUTY DRUM LIFTERS, 800 Lbs. Lift, rotate and control the pouring of drum at or above your reach. Pouring drums above your reach is easy. Standard Duty Drum Lift Carrier allows you to control drum tilting 360° in either direction. Dispense drum contents with your hoist or crane. Even lift and invert a drum with drum faucet in place. These below-hook drum carriers have a pull chain to control the drum tilt with a 30:1 gear and sprocket ratio for pouring drums.CUSTOM ORDERS ARE OUR SPECIALTY!Options: Stainless Steel Wash-down models available for food and Pharmaceutical applications.Spark Resistant Models Available for explosion proof controled environments. HEAVY DUTY DRUM LIFTERS, 1500 Lbs. The Heavy-Duty Drum Lift Carrier enables you to pour a drum weighing up to 1,500 pounds above your reach. You control drum tilting 360° in either direction. Dispense drum contents with your hoist or crane.Options: Stainless Steel Wash-down models available for food and Pharmaceutical applications.Spark Resistant Models Available for explosion proof controled environments. EXTRA HEAVY DUTY DRUM LIFTERS, 2000 to 2500 Lbs. The Extra Heavy-Duty Drum Lift Carriers enable you to pour a drum weighing up to 2,500 pounds above your reach. You control drum tilting 360° in either direction. Dispense drum contents with your hoist or crane. This Extra Heavy-Duty drum carrier has a pull chain to control the drum tilt with a 150:1 worm gear speed reducer and "extra heavy-duty" rating.ANSI/ASME B30.20 compliance standard for mechanical, below-the-hook lifting devices as it applies to: Rated load markings and unit identificationMinimum design safety factor of 3, based on yield strength, for load bearing structural componentsWelding is performed by certified welders who have passed the ANSI/AWS D1.1 welding qualification testOptions: Stainless Steel Wash-down models available for food and Pharmaceutical applications. Spark Resistant Models Available for explosion proof controled environments. Use the Manual Tilt Drum Lift to lift, move and pour a drum within your reach below a hook on a hoist or crane. You manually control the tilt angle of the drum. Use the built-in tilt lock to hold the drum vertical for transporting, or in horizontal position to pour. They allow you to manually control drum tilting 360° in either direction. Dispense drum contents with your hoist or crane. Even lift and invert a drum with drum faucet in place. These Drum-Karriers require that you manually grasp the drum to control the drum tilt. The drum can be locked in the vertical position for transporting, and locked in the horizontal position to pour. Release locks for hand controlled tilt at any angle.CUSTOM ORDERS ARE OUR SPECIALTY!Options: Stainless Steel Wash-down models available for food and Pharmaceutical applications.Spark Resistant Models Available for explosion proof controled environments. Features an adjustable bracket to prevent the drum from slipping in the holder. Allows you to handle a plasticor steel drum up to 900 Lb. Has 60:1 ratio drum tilt control. Load your drum into the Plastic and Steel Drum Lift Carrier by tilting the drum slightly and sliding the bottom bracket under the drum. Then move the drum holder against the drum and cinch the chain around the drum. Lift the drum carrier with your hoist or crane and rotate drum 360 degrees in either direction. The drum can be held at any tilt angle. The standard drum tilt control is a chain wheel with 12' chain loop.CUSTOM ORDERS ARE OUR SPECIALTY!Options: Stainless Steel Wash-down models available for food and Pharmaceutical applications.Spark Resistant Models Available for explosion proof controled environments. Pour any drum with suitable top rim with or without ribs. Pour rimmed steel drum, plastic drum or fiber drum below hook. Adaptable to a range of drum sizes and types. Efficient to use with great ease of loading drum. You can lift any drum from a 4-drum pallet.Lift a vertical or horizontal drum. Place drum in vertical or horizontal position.CUSTOM ORDERS ARE OUR SPECIALTY!Options: Stainless Steel Wash-down models available for food and Pharmaceutical applications.Spark Resistant Models Available for explosion proof controled environments. Fiber Drum Lift Carrier enables you to pour a fiber drum, steel drum or cylinder above your reach. They adjust to a range of diameters and allow you to control drum tilting 360° in either direction. Rubber faced grip pads are tightened by hand-crank to fit drum diameter. Dispense drum contents with your hoist or crane. These drum carriers have a pull chain to control the drum tilt with a 30:1 gear and sprocket ratio.Model 186 for 15" to 23" diameter containersModel 184 for 8" to 15" diameter containersOptions: Stainless Steel Wash-down models available for food and Pharmaceutical applications.Spark Resistant Models Available for explosion proof controled environments. Engineered to meet the toughest of demands the Power Tilt Drum Lift Carrier gives you full 360 degree control of the powered drum rotation to dispense your drum. Control the drum tilt with a 2-button pendant on AC models or a hand held control valve on air powered models. Options: Stainless Steel Wash-down models available for food and Pharmaceutical applications.Spark Resistant Models Available for explosion proof controled environments.